You might have thought that squirrels got their seemingly endless energy for chasing each other, gathering nuts and taunting other animals naturally, but it turns out that squirrels might like coffee just as much as we do. Or at least they have a thing for coffee mugs. 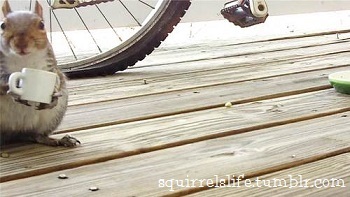 Archie McPhee sells a Squirrel Coffee Cup that is perfectly sized for our rodent friends. The porcelain cup measure 1-1/4″ x 1-1/4″ and is just the right size for a squirrel to pick up and sip from – as illustrated by this squirrel in A Squirrel’s Life, who certainly seems pleased with his.